If you own an Amazon smart speaker, like the Echo or Echo Dot, you can listen to Hot 98.3 ! First you need to enable our “Skill”. 1.Say, “Alexa, enable the Hot ninety eight, three Skill”. 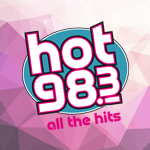 2.Visit the Skills section of your Alexa Smartphone App and search for Hot 98.3. After you have enabled the Skill, listen to our station just by saying “Alexa, play Hot ninety eight, three”. After doing either of these, anytime you want to listen to Hot 98.3, all you have to say is “Alexa play Hot ninety eight, three”.